My girlfriend Rosalinda Garcia, a teacher from Grand Prairie, Texas, has cancer. It's bad, and it's good in that Rosalinda is loving life every single minute. On Monday, April 20th, I'm reading at the Latino Cultural Center, a place that is a dream come true for me, as the appointee on the Commission for Cultural Affairs who initiated and led its establishment in the early stages. I couldn't have done it without Maria T. Garcia Pedroche. Dr. Catalina Garcia. Diana Flores. Regina Montoya. Felix Zamora. And Rosalinda Garcia, who listened, protested, and helped me with her powerful listening, patience, support, protesting, marching, and most of all, love. So I am dedicating my reading to her. Golondrina is a love story based on my mother's life. And like her, Rosalinda is a golondrina--questioning, freedom-loving, fearless. Most of all, she knows that love is the land we're seeking. from Golondrina, why did you leave me? 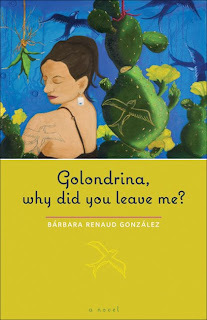 Praise for Golondrina, why did you leave me?